Ideal’s 1985 advertisement for Kitt & Kaboodle isn’t a sassy take on Michael Knight and his crime-fighting car. 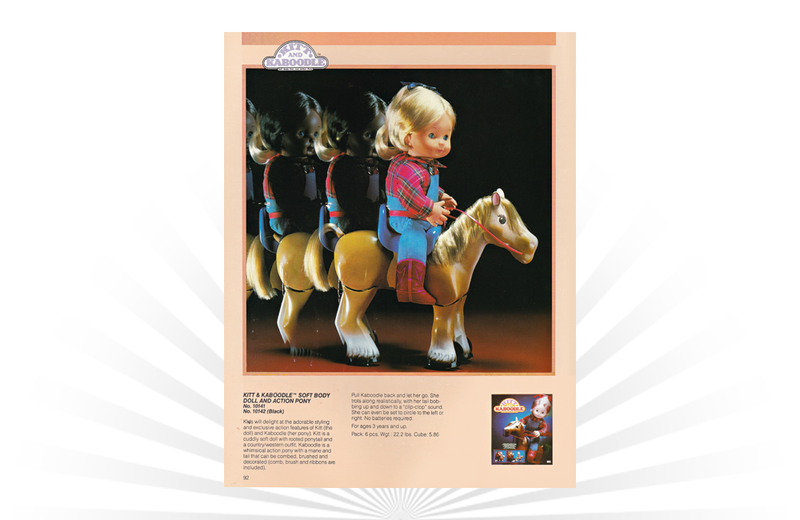 This duo combined a “cuddly, soft doll” and her “whimsical action pony.” Kitt came complete with a rooted ponytail and country/western outfit while Kaboodle featured a mane that could be combed, brushed, and even decorated with include accessories. Pulling Kaboodle backward ever so slightly and letting her go caused the pony to move forward in a trot, complete with a bobbing tail and a “clip-clop” sound. "A Go-Go's new. A Go-Go's fun. A Go-Go goes with everyone!" "You know it's so much fun to eat at Ralph's!"